1. If you haven't yet done so, provide your company address in the 'General settings->Company options' section. Make sure you provide this address correctly - it will be submitted to the real-time shipping calculator as the origin address for all shipments from your store and thus will affect the shipping rates. 2. Obtain an account with Canada Post (Sign up at http://www.canadapost.ca/). 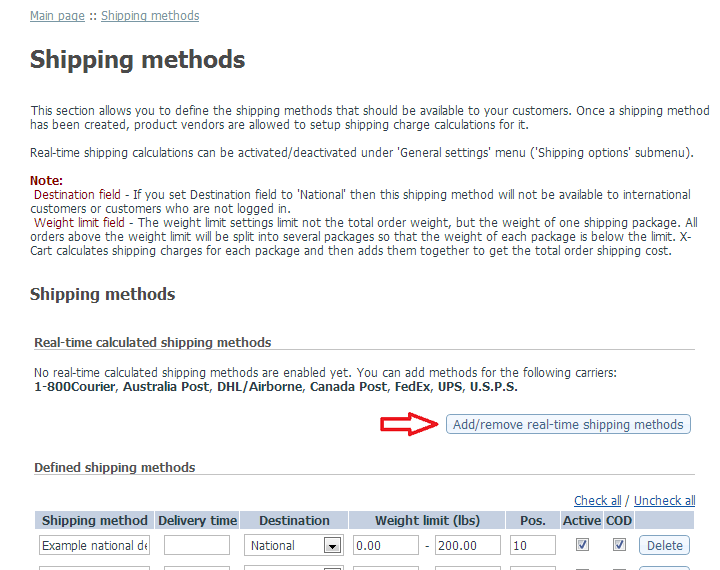 Select the check box Enable real-time shipping calculation. 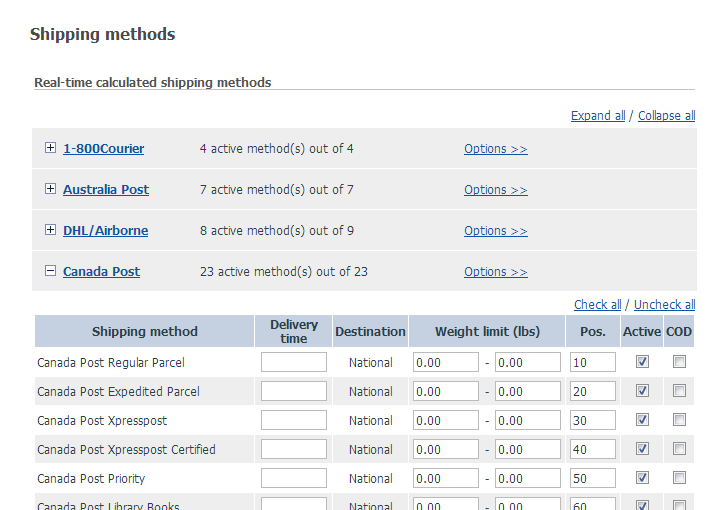 Make sure the check box Use InterShipper calculation service is not selected. The below API Key is for: Select Development or Production based on whether you will be using Canada Post in Development or Production mode. Depending on your selection, you will be supposed to enter the respective type of API key in the fields below. CanadaPost username and CanadaPost password: Enter the API key you obtained from Canada Post. To learn about API keys, click here. CanadaPost merchant ID: Enter the merchant ID you obtained from Canada Post. a. 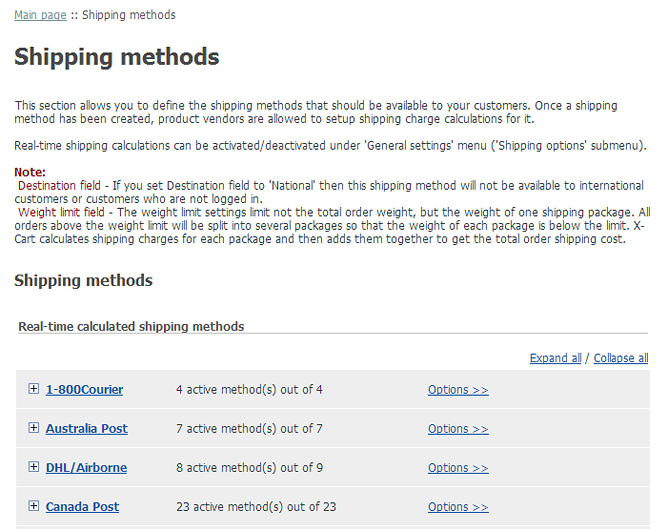 Go to the 'Shipping methods' page of your store's Admin area (Shipping and Taxes menu->Shipping methods). 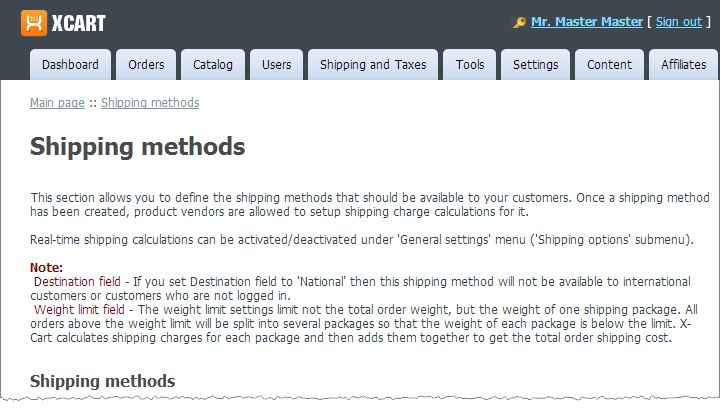 Enable the methods you are going to use (Select the respective check boxes and click Apply changes). Disable the methods you are not going to use (Unselect the respective check boxes in the 'Active' column). 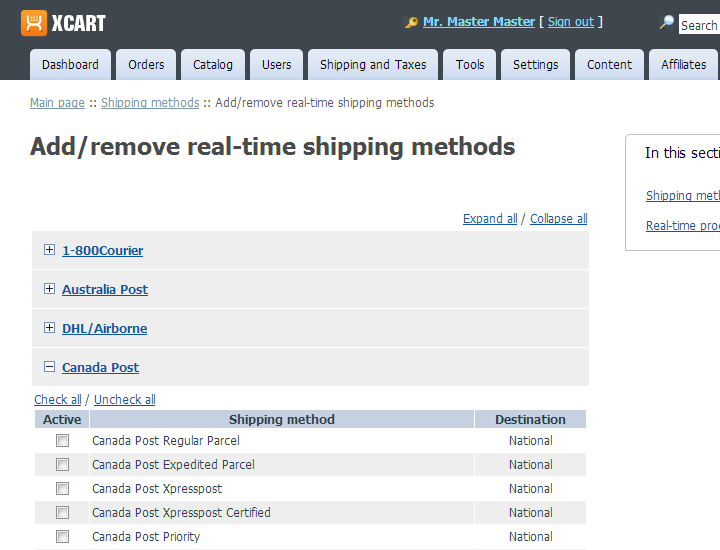 Click the [-] Canada Post link; the list of Canada Post methods will be collapsed. c. Click the Options >> link opposite the [+] Canada Post item. The 'Canada Post options' page opens. 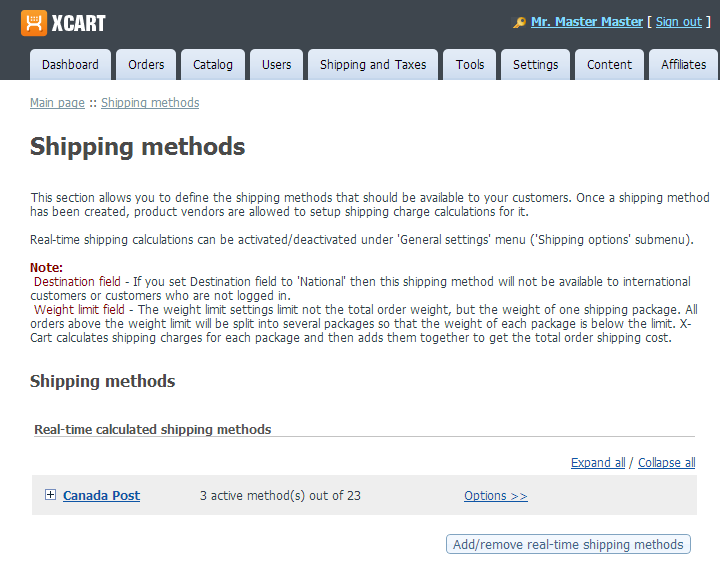 d. Adjust the settings on the 'Canada Post options' page. e. Click the Apply button. Your Canada Post commercial customer number: Your Canada Post commercial customer number. This value is required. Your contract number (This must be provided for commercial (contracted) rates, if exists. Leave empty for non-contract rates): Your contract number. Quote type: Choose "commercial" to get contracted rates (as contracted between you and Canada Post). Choose "counter" to get rates you'd get over the counter (without a customer or contract number). The customer number of the owner of the mail (mailed on behalf of customer). (up to 10 digits)(required): Your Canada Post commercial customer number. This value is required. Important: The customer number must be entered without the leading zeros. For example, if the Customer Number in your Canada Post account says "0001234567", you must enter just "1234567". Omit the element for non-contract rates or provide the contract number for commercial (contracted) rates. (up to 10 digits)(optional): Your contract number. This must be provided for commercial (contracted) rates, if exists. Leave empty for non-contract rates. Either commercial or counter. 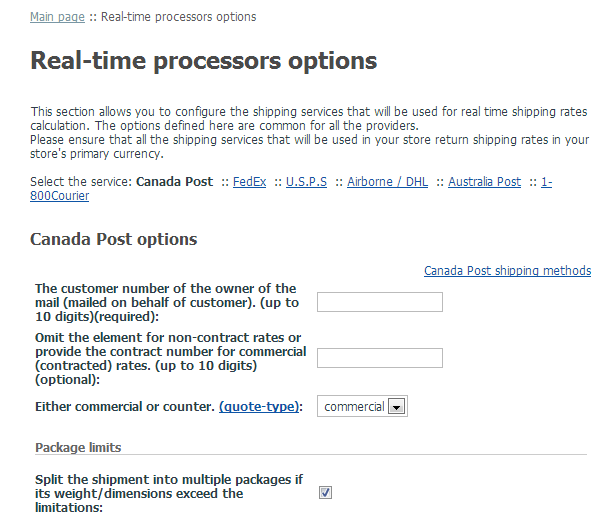 (quote-type): Choose "commercial" to get contracted rates (as contracted between you and Canada Post). Choose "counter" to get rates you'd get over the counter (without a customer or contract number). 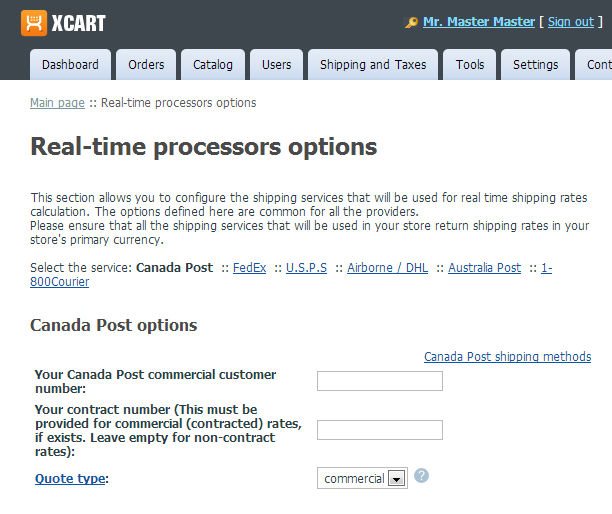 To get the Canada Post rates, X-Cart sends requests from your server to sellonline.canadapost.ca (Canada Post's server) via port 30000. If outgoing connections via port 30000 are not allowed on your server, it will cause the error in question. To fix this issue contact your hosting support or the server admins, and ask them to allow outgoing connections via port 30000. 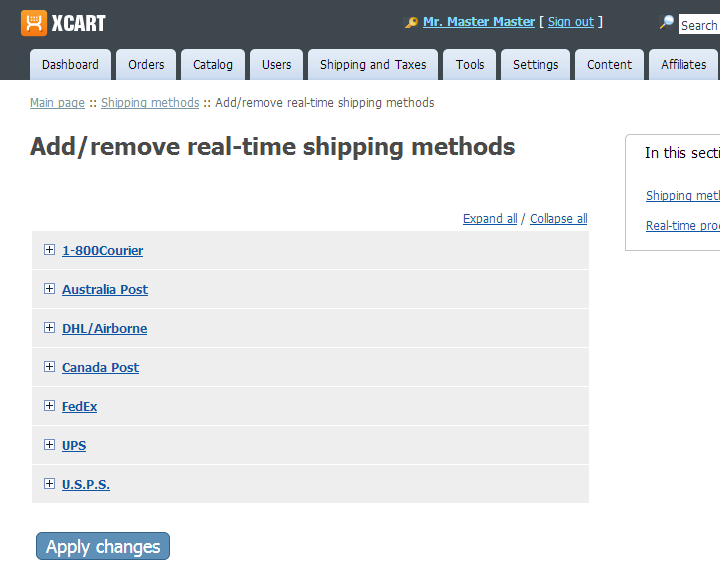 Download the File:Test connection to canadapost.php.txt, save the downloaded file as 'test_connection_to_canadapost.php'. Upload test_connection_to_canadapost.php to your web server's document root. This page was last edited on 30 September 2013, at 07:03.